The TripAdvisor for Business app allows businesses to display TripAdvisor content like user reviews, photos, and awards directly on their Facebook business Page. You can also use the app to encourage Facebook users to leave a review of the business on TripAdvisor directly through the app. By feeding content directly from TripAdvisor, your business can leverage TripAdvisor content, which adds variety and further credibility to your service or product. Here’s how to add it with the help of Facebook Business Manager. TripAdvisor is one of the leading review sites for hotels, restaurants, and attractions. With over 702 million reviews on the site, it absolutely makes sense to maximize all the features available to businesses on TripAdvisor, including its Facebook Integration. TripAdvisor offers free widgets that easily integrate the TripAdvisor experience on your website or as part of your social media marketing strategy such as the “featured on TripAdvisor” or “Certificate of Excellence” buttons. (You can also use a third-party review widget like Amplify to show Facebook and TripAdvisor reviews). However, there are other tools available that can reach current and future customers on social media including the TripAdvisor Traveler Reviews Facebook App. Who Can Install the TripAdvisor App for Facebook Business Page? Any business on Facebook can get the TripAdvisor app, but you need to consider if adding it will really benefit the Facebook Page. The overall goal of integrating with Facebook is to provide additional information that furthers the brand, creates additional trust, and conveys a positive image of your business. This means that your TripAdvisor profile needs to be complete and full of information that might not be available on its Facebook counterpart. If the TripAdvisor listing contains incorrect or incomplete information, you might need to fix these issues before showing it off on Facebook. However, there’s also an argument for using the app on Facebook to grow your audience. By showing the app, you show people that you have a presence on other major review sites. Additional engagement with customers can increase your overall reach, which can bring in new fans who want to learn about your product or service. What If I Have Bad Reviews or a Poor Overall Score? Negative reviews and the inability to choose the reviews that show up on the widget are potential dealbreakers for some TripAdvisor listing owners. However, you can still add the app if you think it helps in the long run. In fact, you can choose to omit the current feed of TripAdvisor reviews on the app while still encouraging more people to leave a review on both Facebook and TripAdvisor. Just like reviews, you can choose to allow the app to show off your awards (specifically, the Travelers’ Choice, Certificate of Excellence, and GreenLeader awards) and photos from TripAdvisor. If you have appealing content in these areas, you should show it to your Facebook audience. This can help cement your online reputation and also keep people interested in the business. With reviews potentially flowing in on both TripAdvisor and Facebook, you should have a review response strategy ready to make the most out of the integration. Review responses are a great way to show future customers that you are willing to do whatever it takes to deliver the best possible service and always make things right. 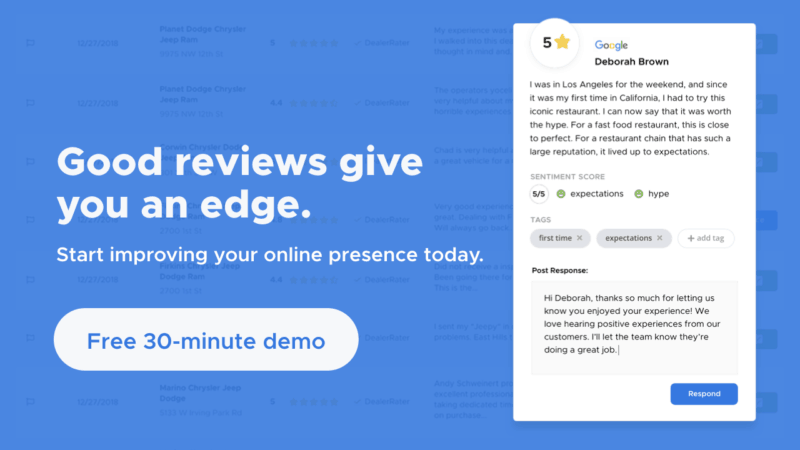 You can track and respond to each review manually on each site, but that can take up plenty of valuable time during the day. Fortunately, there are review management solutions available that can make the job easier for you. How Do I add the TripAdvisor App to a Facebook Page? Log into Facebook in your role as administrator of a business page. You’ll need the Facebook business login information for the app. (You’ll need to claim your Facebook page if you haven’t already done so). You are then redirected back to Facebook, where you already logged in your page administrator role. If you manage multiple Pages you’ll see a dropdown menu that shows all of the Pages you manage. Select the business Page that will receive the widget. Once you have installed the TripAdvisor Facebook widget to your business Facebook page, you can customize which sections of the app you would like to feature on your page by clicking on the “Customize” link in the top-right corner of the app. Adding this widget to your Facebook page is a smart move, and it’s another free marketing tool that can help your online reputation. The incorporation of review websites across your entire branding environment is both a win for you and for your customers. I am not sure that this app will help your business. There is no option of deleting and preventing bad reviews and that can ruin your business. Also there is no option of replying to the review, so you can’t even explain why you got a negative review. FB is still trying to be one of the most influential review provider, but there is a long way to go before it actually become one. I don’t see why I shouldn’t do this. You are absolutely right. Having a tripAdvisor app at your page could only increase your business revenue. what will I do if the Page I want to select is not in the selection tab? please answer back. thanks! What you could do is confirm that your business listing is on TripAdvisor. Visit https://www.tripadvisor.com/Owners and perform a search. If it’s not listed, fill out the form at https://www.tripadvisor.com/GetListedNew. Let us know if that works! Same as Brian, I cannot see the TripAdvisor reviews on my Facebook Page from a mobile phone. Considering mobile phones are most probably the primary internet usage device, how can I make it appear on the mobile facebook version of my page ? I hope you can help me! can’t see TripAdvisor Review Tab when access my facebook page from Iphone. I agree with Corinne that people access Facebook on Mobiles more than on desktop so generally it would help a business collect more reviews. HI , I have installed this app, but it is not visible via phone? Because most of our viewers are accessing our page via mobile, this is a problem. Is there a way to customise this and make it shown on mobile?? Now, tripadvisor has just ditched all their thousands of users on the “cities i’ve visited app”. They do not reply to any comments, and are basically creating their own end-of-life. I wouldn’t invest one cent in such a company. They do not even understand that their users are the fundation of theitr business.